Born in 1936 in Belarus, Ivonka Survilla was raised in France. She studied Fine Arts at L’Ecole nationale supérieure des beaux-arts in Paris and earned a degree in modern languages from the Sorbonne in 1959. Married to Janka Survilla in 1959, she moved to Madrid, Spain, where she worked as a journalist, and taught at the French Institute. Her daughters Hanna and Paulinka were born in Madrid. In 1969, she moved to Canada accepting a position with the Federal Translation Bureau in Ottawa where she has held various management positions until her retirement in 1996. Together with her husband Janka, Ivonka Survilla has been active in the Belarusan community in Canada. 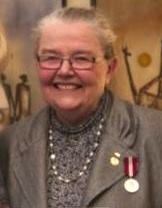 She was elected president of the Belarusan Institute of Arts and Sciences in Canada in 1974. In 1984 she was elected to the board of the Canadian Ethnocultural Council, an umbrella organization which represents thirty-four national ethnocultural associations. Until the Chernobyl disaster, she was an active member of the arts community in the National Capital Region, and participated in some thirty exhibitions in Canada and in the United States. After the Chernobyl disaster in 1986, she began to lobby in favor of humanitarian aid to the victims of Chernobyl in Belarus. In 1989, together with husband Janka Survilla, Pauline Paskevich and Zina Gimpelevich, she founded the Canadian Relief Fund for Chernobyl Victims in Belarus (CRFCVB), sending medical aid to Belarusan hospitals and bringing young victims of Chernobyl for summer stays in a healthy Canadian environment. In 1997 the program brought more than six-hundred Belarusan children to host families across Canada. The Fund also brings medical staff from Belarus to Canadian hospitals to provide experience in the latest medical procedures. After her election to the presidency of the Rada of the Belarusan Democratic Republic in exile, Ivonka Survilla resigned from her position as the president of the CRFCVB which she held since its creation. With the success and health of the Chernobyl Fund, she felt that she could contribute in a more effective way to the restoration of democratic processes in Belarus.